Providing Stafford and surrounding cities with top-notch dumpster rental service. We specialize in great customer service. When you call you should expect prompt delivery of your dumpster rental in Stafford. Our knowledgeable staff will help make sure your waste management needs are met. Whether you are cleaning out your garage or building a new home, we have what you need. Understand the best size container for your job or project. Call to receive an accurate quote and order your bin. We will deliver your container on the date specified for you to fill up with all your trash and debris. We then take care of the rest by hauling the roll off dumpster to the dump for proper disposal. Our Roll Offs are great for residential projects such as moving, remodeling, or cleaning out your home and/or garage. The durability of each container provides ample room for hauling large and small debris. Common uses for commercial dumpsters include demolition, new home build, construction dumpsters, roofing, and general contractor needs. 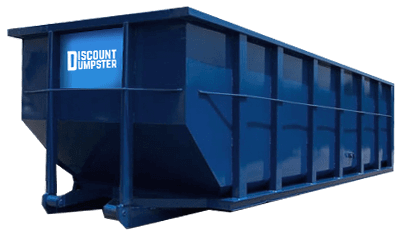 Discount Dumpster includes all fees and taxes when quoting a price. That means delivery, hauling, fuel, environmental, pickup, and disposal is included. Dumpster pricing is largely dependent on the size of bin you will need along with the location. The best way to receive an accurate quote is to call our office. We will be able to instantly help you and make sure your dumpster rental experience is smooth from the start. We accept all major credit cards including Visa, MasterCard, American Express, and Discover.